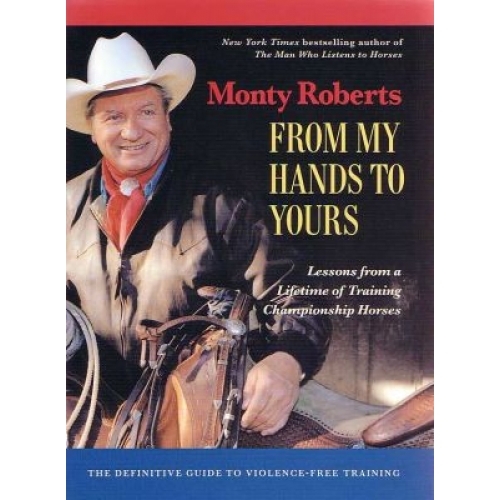 Urban Horse Promotes - From My Hands To Yours - Lessons from a Lifetime of Training Championship Horses Hardback Book by Monty Roberts. Monty Roberts' definitive guide to violence-free training and bestselling author of 'The Man Who Listens to Horses' brings you a long awited thorough colleciton of training techniques and philosophies to help you understand your horse and communicate with him in a partnership that will last a lifetime. "In a world that has shrunk to a global village, it is important that mankind act as a responsible steward of creation - whether human or animal. Monty Roberts, in his life's work of perfecting communiation without pain or fear, achieves this with respect and love for all creatures. I am very proud and priviledged to have Monty as a friend and teacher. This book is a gift to us all." - Terry Pendry Stud Groom to Her Majesty Queen Elizabeth II, Windsor Castle. The heart of this book is a step-by-step explanation, copiously illustrated with drawings and photos, of how Roberts works in the round pen. Using a method he calls 'Join-up', he causes horses to willingly enter into partnership with their trainers, entirely without coercion or violence.